It was early and there was a lot of movement in the dormitory. I arose to be one of a handful still packing at 6.30am. At 6.50am one of the ‘friendly’ volunteers from the albergue said ‘Good Morning – Lets go!’. I was happy to leave as the atmosphere in the albergue had not been so welcoming. 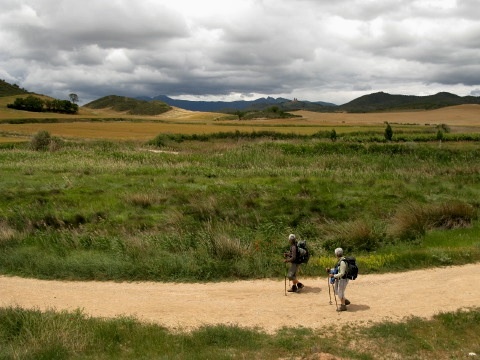 Walking out of Estella I met two girls from California who were struggling slightly with some blisters. They exclaimed how surprised they were to find so few Americans on the walk. The walk, they added, would appeal to the outdoor types they knew at home. Two Italian guys appeared and we all walked together for a while. 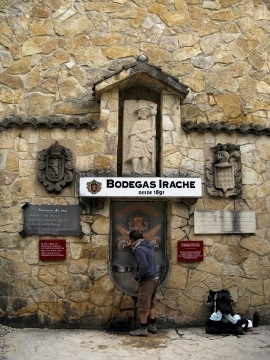 The girls continued while Gigi and Lorenzo stopped at the wine fountain. I tasted some wine with Gigi and Lorenzo before filling up the water bottle with some to accompany lunch later in the day. 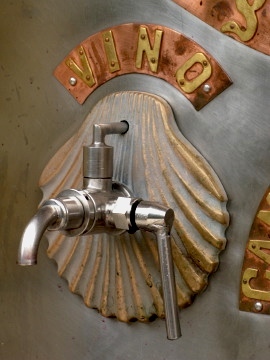 There were two taps of red wine and one of water, with a gentle reminder not to abuse the free wine on offer. A kilometre later there was a man handing out vouchers for a free coffee further on at the village of Villamayor de Montjardin. I took one not really planning on stopping. The day was warming slightly and becoming very pleasant for walking. The country was grand and magnificent with a wide valley bordered by tall rocky cliffs to the North. The fields glowed warm in the sunny spells between the fleeting clouds. 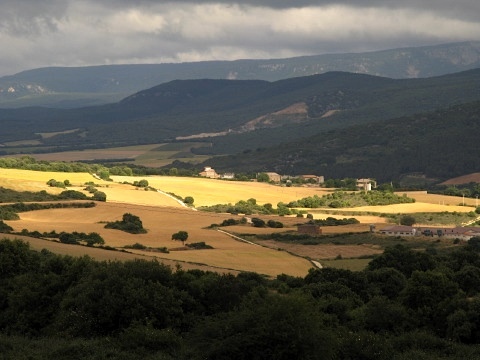 The Way of Saint James followed the South edge of the wide valley and soon led to the village of Villamayor de Montjardin. There was the wonderful church of San Andres. Luckily the door was open and the lights were on. 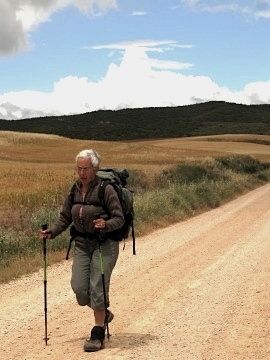 A local was explaining the church’s history to some other walkers. 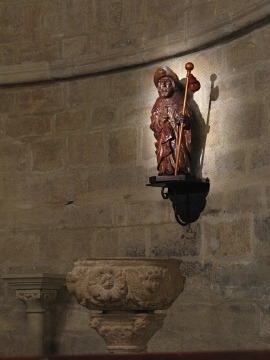 At one end was a statue of Saint James lit up with a single spot light. The church was peaceful and relaxing and I paused to sit quietly reflecting on the journey so far and the journey still to come. The keeper of the church pointed out the huge silver plated 12th century cross with a lamb on its reverse. It was a tradition for pilgrims to make a wish in front of the cross before continuing on their way. I made a wish hoping for peace and safety for everyone I knew. The lights went out and I didn’t have a 1 Euro coin to put in the electricity box by the door. I left and passed the cafe advertised on the voucher. I did buy an expensive donut with my free coffee voucher and concluded that the coffee was not exactly free! After the village the Way descended through vineyards and crossed under a main road before returning to the serenity of the countryside. The valley opened up and the light was subtle bringing out the colours of the vegetation. The day was not hot, partly cloudy and with a wonderful breeze. I mentioned that it was like a natural cathedral to another person who stopped with me to admire the view. There were quite a few walkers passing through the scenery ahead. One couple seemed to be angry however. A woman walked quickly ahead of her male companion. When she reached the top of a climb she would wait for him only to stride off again as soon as he arrived! There seemed to be a lot of tension between them. I was surprised as they were probably not enjoying the scenery as I was. In contrast I descended into the valley feeling calm and with a sense of real joy. How silly to miss the beauty. I met with Lorenzo again. Lorenzo was a photographer. We shared our interest and was saddened by his stories of the war zones he had visited and the destruction of life and property he had experienced. He had traveled to many places blighted by war and had been deeply affected at times by what he had seen and photographed. At Los Arcos I came across Takumi again who was having lunch. He directed me to the albergue which was run by Dutch volunteers. It was warm and friendly and in contrast to the previous night in Estella. 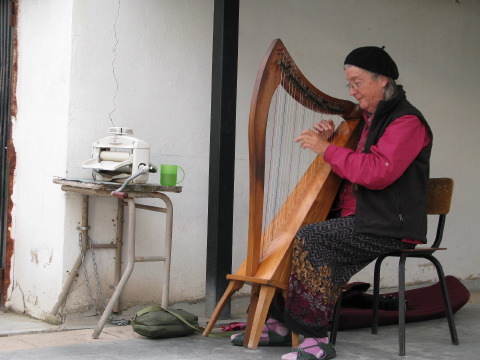 A lady was playing a huge harp by the entrance. Later that evening, just before we all turned in for the night, Martha Gay sat playing renaissance pieces again. She walked the Way with the harp pulled on a trolley behind her. I went to bed amazed at her travels and by the music. 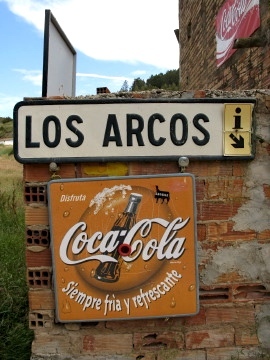 This entry was posted in From the Way and tagged Estella, Los Arcos, Via Frances, Way of Saint James, Week Six. Bookmark the permalink. Post a comment or leave a trackback: Trackback URL.